About 400 young people are currently in training at ebm-papst locations in Germany. In Mulfingen alone, they can choose from twelve professions and nine dual study programs. According to a study by Capital, a business magazine, and ausbildung.de, a training portal, ebm-papst is among the best companies in Germany for training programs. But the fan and motor manufacturer has no interest in resting on its laurels, especially since it is becoming increasingly difficult to recruit young people in rural areas. “Applicant numbers for training positions in Mulfingen have been falling steadily, from 1,000 in 2013 to less than 500 now,” says Bernd Ludwig, who has been in charge of training at ebm-papst for 25 years. “And most of them are interested in commercial rather than scientific or technical professions.” But technical talent is indispensable to safeguard the future for the innovative world market leader. Most applicants are interested in commercial rather than scientific or technical professions. 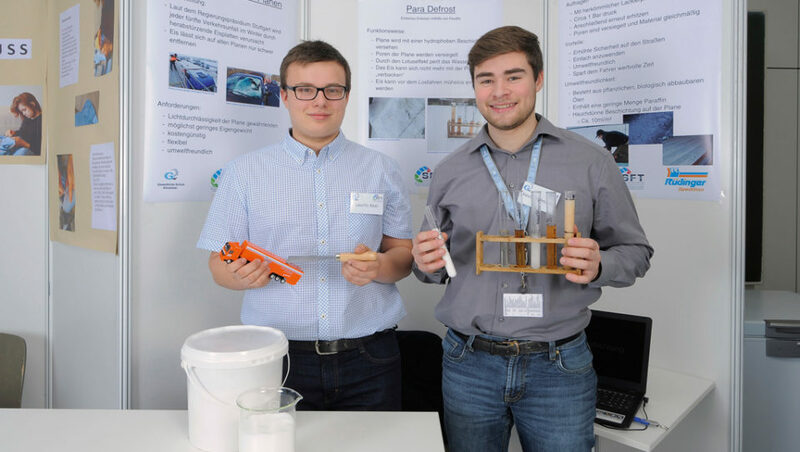 So when the organizers of “Jugend forscht,” a German science contest, approached ebm-papst more than 20 years ago about sponsoring the contest for the Heilbronn-Franconia region, company management wisely approved the request as they considered it an ideal platform for promoting interest in technology among young people and for recruiting fresh talent. That turned out to be a good decision. The clever high-schooler had exactly the kind of traits ebm-papst is looking for in young employees: soft skills, team spirit and enthusiasm for technology. “Even as a kid, I was interested in all kinds of technical stuff, and later I repaired old tractors myself,” says Lauritz Abel. While the event was still in progress, Bernd Ludwig spoke with him about his training prospects at ebm-papst. Six former Jugend forscht contestants have started their careers in Mulfingen so far. Except for Lauritz, all of them knew ebm-papst already. “Most of them were with TICK, the ‘Technik Initiative Campus Künzelsau,’” says Ludwig. With TICK, Heilbronn University and ebm-papst support the technical curriculum at local schools from the 8th grade onward with software and hardware and enable young hobbyists to experiment and play around in extracurricular technology working groups. “Jugend forscht is just one of many venues where we get acquainted with young people and they with us,” adds Ludwig. Those who take an interest in technical training have much more to choose from than studying engineering or learning a trade. They can even do both at once thanks to a cooperative study program offered by Heilbronn University and leading regional companies since 2000. Lauritz Abel also chose this model. As he explains, “First I’m getting two years of training to become an electronics technician at ebm-papst, then I’ll study automation in Künzelsau for a bachelor’s degree.” So theory comes after practice; first the young people learn the processes and requirements of the workplace, and then they can approach their studies from a much different perspective. ebm-papst can take on six such cooperative study students per year. 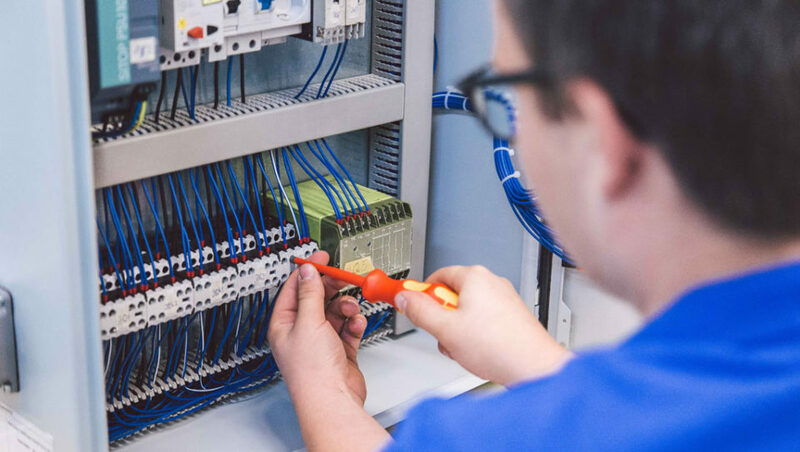 First I’m getting two years of training to become an electronics technician at ebm-papst, then I’ll study automation in Künzelsau for a bachelor’s degree. But whether student or trainee, Bernd Ludwig and his team make sure that all 70 to 75 newcomers per year can intensively put their skills to use and improve them from day one. “It’s important to us that our young employees are quickly able to work independently and take on responsibility,” he says. For “his” trainees, that also applies outside their specialties – in interdisciplinary, social and digital projects such as the media working group, the trainee home page, exchange programs or the energy scouts who have been searching through the company looking for ways to save energy since 2010.